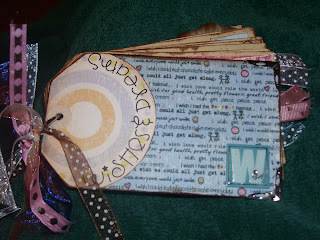 I wanted to share some pictures of a little tag book that I did recently. I wish that I could say that it was my own creation, but...it certainly isn't. The owner, Tammy, is an awesome talent. She had some prizes for her Grand Opening. And I thankfully won this kit. I will add that it has certainly sparked some need, in me, to stick paper to things and age them with ink. We'll see how far I get and how much I will get done.